Read the information below to learn more about the opportunity. If you want to apply please download this Application Form. 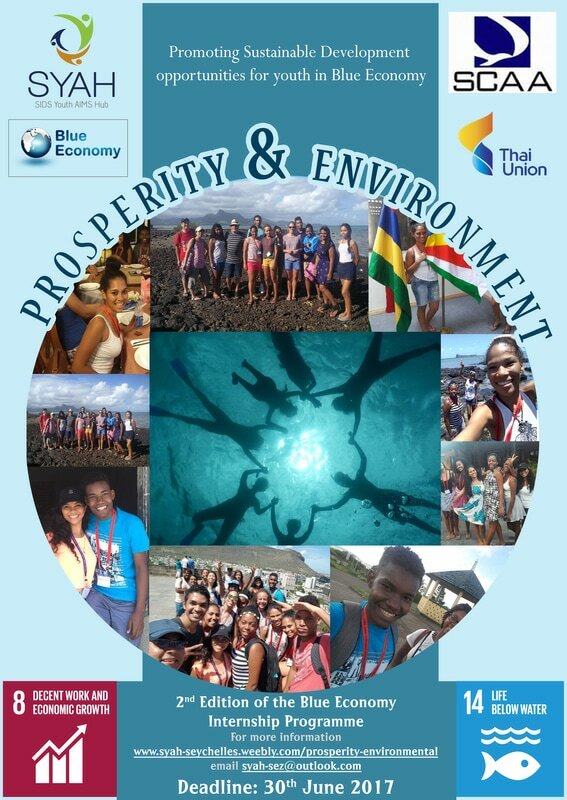 To commemorate World Ocean Day, SYAH-Seychelles has launched the second edition of the Prosperity & Environment: Blue Economy Internship programme. Supported by Thai Union, SCAA and the Government of Seychelles, 40 young people will be offered the opportunity to obtain hands on experience of working in organisations related to the Blue Economy. SYAH – Seychelles seeks to revolutionise the career guidance provided from one of talks or what is seen in movies to real life experience in the field and advice from people working in such fields. The programme provides young people with the opportunity to get hands on experience in different organisations for 2 weeks in the Seychelles. The participating organisations include Seychelles Ports Authority, Hunt Deltel, Seychelles Bureau of Standards, WISEOCEANS, Seychelles Coast Guard, Seychelles Air Force, Seychelles Maritime Safety Administration, Indian Ocean Tuna canning factory, SOCOMEP and a PhD candidate, Ameer Ebrahim, among others. The programme has an equally strong entrepreneurship strand. Opting for this strand will help the interns to cultivate their entrepreneurial spirit. During the internship, young people will be encouraged to identify gaps and propose ways to bridge those gaps through enterprise within the Blue Economy sector. They will then be provided with an experience business mentor from the industry for one-on-one sessions. During these one hour sessions (maximum 2), interns will be advised/guided on how to further develop their idea and build on a business plan. For those not opting for the entrepreneurship strand they will be required to develop a presentation on an assigned topic based on their internship experience (Details to follow after selection). In order to provide flexibility to participants around their studies and engagement, this year SYAH has introduced two different internship sessions. Session 1 : 21st August - 8th September and Session 2: 11th -22nd December. Participants must specify their session of preference in their application form. This shall be taken into consideration and will not affect the selection process nor the participants selected for the Mauritius trip. Please note that not all the same organisations are participating in both sessions. Following their time with the organisations in Seychelles and completing certain essential tasks for successful completion of the programme 12 outstanding participants will be flown to Mauritius in January 2018 to follow an intensive ten day programme learning about the different organisations in Mauritius as well as substantial issues relating to the ocean such as mariculture, ocean conservation and the fishing regulators. The other participants will possibly have the chance for a short stay in Silhouette to learn about the importance of conservation. At the close of the programme the young people walk away with an enriched experience, certificate of recognition, letter of recommendations and an invaluable network of Blue Economy professionals and peers. Do you want to learn about the opportunities available in the Blue Economy? Do you want to obtain hands on experience in different organisations? ​Find out more about APPLYING. You can send us an email on syah-sez@outlook.com requesting an application form or collect a form at the Seychelles National Youth Council. The form can be filled electronically or hard copy. It can either be emailed back to us at syah-sez@outlook.com OR submitted to the Seychelles National Youth Council (Orion Mall). The deadline is 26th November 2017. With the support of the Department of the Blue Economy, we have secured the funding for the 2nd edition of the Blue Economy Internship Programme. This year's edition is sponsored by Thai Union (Indian Ocean Tuna Ltd), Seychelles Civil Aviation Authority (SCAA) and the Government of Seychelles.